As BRICS leaders met in Ufa, Russia, for their annual meeting late last week, there were expectations and anxieties galore. The group met as tensions between Russia and NATO rose, Europe’s circus of the absurd (the Greece crisis) continued, impending global agreements on sustainable development and climate action were being negotiated, and celebrations for the 70th anniversary of the UN approached in New York. All of this at a time when the liberal international order was shown to be inept at managing radicalism, barbarism, parochialism and illiberalism across the world. The BRICS member states are also experiencing their own specific political moments. Russia is struggling to cope up with the dynamics of the energy sector economy and is involved in an intractable conflict in its neighborhood. Brazil seems to have lost the ‘Lula mojo’ and is fighting economic and political inner demons. South Africa and its enthusiasm for being the gateway to Africa has suffered a body blow with reports of a series of fatal attacks on African migrants. India is pre-occupied with rewriting its story under the tireless outreach of Prime Minister Modi, who is exclusively focused on reshaping India’s economic trajectory. And then there is China, which is putting together the plans and institutions that might soon constitute the ‘Beijing Consensus’ that could dominate the geo-economic landscape over the next few decades. The 77-paragraph outcomes statement from the summit was inevitably going to be a list of ideas that would cater to different expectations and aspirations of each of its members. For Russia, the political takeaways are the key. If one was to go through the list of Russian proposals on BRICS cooperation in the months leading up to the summit (some at the official level others at track II dialogues), you would detect an aspiration to create a political aggregation among the BRICS collective. These proposals included an ambitious agreement on cyber security, cooperation on outer space, peace and conflict treaties, a proposal on planetary defence, a new agreement on non-aggression and peaceful co-existence, non-proliferation arrangements around new technologies and even a new arms control and export control regime. As Russia’s global legitimacy shrinks, the role of BRICS as a legitimising platform becomes more important for Moscow. For many Russians, the world has moved on from the Cold War of the last century to the ‘Hot Peace’ of the current one. To them, BRICS must be a force for stability, and one that can counter what they see as the eastward expansion of the Atlantic alliance. That the official statement covers some of these Russian ideas (watered down, no doubt) is Russia’s gain. The import of BRICS for the Chinese is starkly different. They are in the process of resetting some key rules that have defined postwar geo-politics and geo-economics. To them, BRICS may be another platform that will institutionalise and promote those facets of global engagement that benefit China. While confrontation between Russia and NATO is something from which Beijing would wish to keep a healthy distance, China’s leaders realise that a beleaguered Russia offers them a chance to consolidate their ‘March west’ agenda, through the central Asian and Eurasian landmass and into the heart of the EU. Still, never in their wildest dreams would China’s leaders have imagined the servility Russia is now demonstrating. A Russia that once killed the opportunity to integrate with Western Europe because Moscow was unwilling to play anything less than ‘big brother’ now seems willing to play second fiddle to the Chinese dragon. Such was the level of kowtowing to China’s ambitions and agenda that many at the track II meetings over the past couple of months remarked that Russia had officially replaced South Africa as China’s ‘B Team’ within BRICS. One Russian proposition went so far as to suggest that the New Development Bank (NDB; a joint BRICS development bank but one which is strongly influenced by Beijing) must support and lend to the Chinese One Belt One Road initiative. This was reminiscent of the concentration of all financial flows in the past century serving to reinforce US power. But for Beijing, BRICS could offer three key benefits vital for its national project. First, BRICS offers a truly large economic landscape on which the experiment to internationalise the Renminbi could begin. The NDB, the trade cooperation agreement and the economic cooperation pact among BRICS could facilitate this. The second key advantage has to be diversification of the Chinese product market by moving towards an eventual BRICS Free Trade Zone, seeds for which were planted in Ufa. The final advantage of BRICS for China is the affirmation it gives to the legitimacy of the Chinese system, something no democratic bloc has accorded Beijing before. Outside the BRICS context, it’s hard to imagine Brazil, South Africa and India discussing, defending and promoting the Beijing Consensus, which is premised on everything these three democracies otherwise abhor. 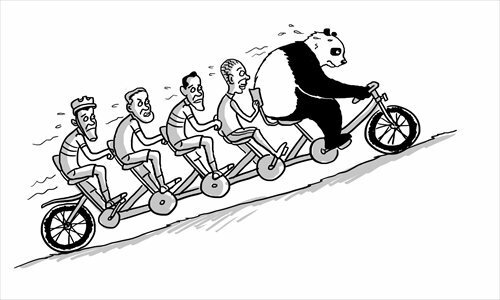 BRICS gives the Chinese dragon the license to drive a wedge in the liberal order. South Africa is a BRICS anomaly; it is dwarfed in demographic and physical size by the others in the group. Yet it is this anomaly that makes the BRICS gambit so important for South Africa – effectively acting as its ticket into the big league. Pretoria has been promised a regional hub of the BRICS bank, which means South Africa will be the node for BRICS into Africa. This puts a potent tool in South African hands but also saddles it with the responsibility of reconciling its differences with other African economies and polities. 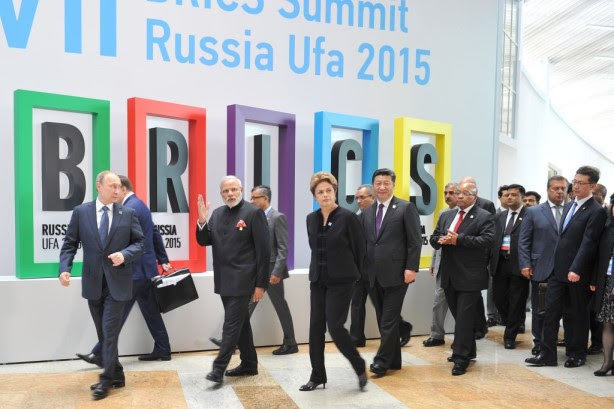 Brazil is struggling to define its role in BRICS, with its attendance reduced to the mundane. Much of this has been due to the Government being bogged down by domestic problems, leading to a loss of the momentum that President Lula had injected. For a country that is still searching for its place in the world, the Lula vision was to move Brazil from being merely ‘that big country on the left of the map’ to becoming a critical partner in the Asian century. BRICS provided it a free ride to undertake this ambitious plan. But it remains to be seen how and when Brazil will overcome its inertia. Finally we have India, in many ways the proverbial swing state for which BRICS could offer the flexibility it needs and without which the BRICS would not just lose its ‘I’ but also a fair part of its identity. For a country that is slowly but surely exhibiting signs of becoming part of the liberal order it once opposed, BRICS is the rhetorical, normative and tactical vehicle to affect its transition from ‘trade union leader’ to ‘global manager’. The BRICS rubric also allows for sustained engagement with China, which could build multiple dependencies. It enables India to demonstrate muscularity on its border dispute with China while concurrently embracing it. For example, the New Development Bank and the Asian Infrastructure Investment Bank enable India to participate in Beijing’s ambitions and benefit from it (it needs huge doses of commercial loans and development finance) without being socialised into ‘Pax Sinica’. BRICS will be beneficial for India if it opts for pragmatism over ideology and sees the Beijing Consensus as means of shaping the discourse of the ‘east’ until it is able to script one of its own. On the other hand, if Delhi chooses to play the ideological card, it will end up on the wrong end of the bargain as it did with the Washington Consensus – staying out and consequently being excluded from the mechanisms and institutions that shape global development and direct global capital. BRICS is also the last hand India has to play with Russia, given the dwindling interdependence between the two states. India fears continental encirclement, owing to increased Russian engagement with Pakistan (visible in the diluted treatment of counter-terrorism in the BRICS outcomes statement) and what it believes is a Russian slide into China’s orbit. Consequently, it will be through the normative processes as well as the economics of the BRICS grouping that India can maintain a serious balancing play with Moscow. Finally we must acknowledge that for all the talk of a rising democratic India being welcomed with open arms by the great powers, India’s acceptance into the Western-led global order has been lukewarm. A deeper integration into BRICS, as the outcomes statement promises, will give Delhi far greater bargaining power in negotiating its place within the global political and economic governance institutions currently dominated by the West. Photo by Flickr user MEAphotography.